Viz Media announced a home video release for the first 13 episodes of the hit series Hunter X Hunter. The collection is uncut and releases October 25th. Best Buy stores in the U.S. will have a special Steelbook Edition along with the standard DVD and Bluray collections. The series is currently airing on Toonami. San Francisco, CA, October 20, 2016 – VIZ Media, LLC (VIZ Media), a premier company in the fields of publishing, animation distribution, and global entertainment licensing, delivers action-packed, supernatural adventure as it announces the home media release of the HUNTER X HUNTER anime series on October 25th. 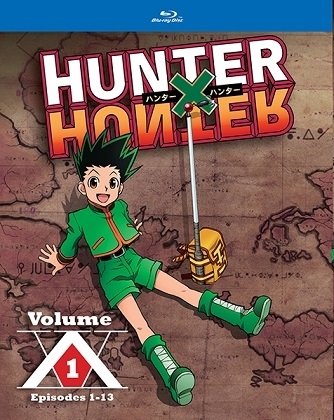 In the HUNTER X HUNTER anime series, abundant riches, hidden treasures, fearsome monsters, and exotic creatures are scattered around the world… Gon departs on a journey to become an elite Hunter who risks his life in search of the unknown. Along the way, he meets other applicants for the Hunter exam: Kurapika, Leorio, and Killua. Can Gon pass the rigorous challenges of the Hunter exam and become the best Hunter in the world!? His wild and epic journey is about to begin! !